Martin Luther King Sr. was born Michael King in Stockbridge, Georgia, the son of Delia (née Linsey; 1875–1924) and James Albert King (1864–1933). He led the Ebenezer Baptist Church in Atlanta, Georgia, and became a leader of the Civil Rights Movement, as the head of the NAACP chapter in Atlanta and of the Civic and Political League. He encouraged his son to become active in the movement. King was a member of the Baptist Church and decided to become a preacher after being inspired by ministers who were prepared to stand up for racial equality. He left Stockbridge for Atlanta, where his sister Woodie was boarding with Reverend A.D. Williams, then pastor of the Ebenezer Baptist Church (Atlanta, Georgia). He attended Dillard University for a two-year degree. After King started courting Williams' daughter, Alberta, her family encouraged him to finish his education and to become a preacher. King completed his high school education at Bryant Preparatory School, and began to preach in several black churches in Atlanta. King became leader of the Ebenezer Baptist Church in March 1931 after the death of Williams. With the country in the midst of the Great Depression, church finances were struggling, but King organized membership and fundraising drives that restored these to health. By 1934, King had become a widely respected leader of the local church. That year, he also changed his name (and that of his eldest son) from Michael King to Martin Luther King after a period of gradual transition on his own part. He was inspired during a trip to Germany for that year's meeting of the Baptist World Alliance (BWA). While visiting sites associated with reformation leader Martin Luther, attendees also witnessed the rise of Nazism. The BWA conference issued a resolution condemning anti-Semitism, and the senior King gained deepened appreciation for the power of Luther's protest. King Jr. became an associate pastor at Ebenezer in 1948, and his father wrote a letter of recommendation for him to attend the Crozer Theological Seminary in Chester, Pennsylvania. King Sr. also made arrangement for King Jr. to work with J. Pius Barbour, a family friend who pastored at Calvary Baptist Church in Chester. Despite theological differences, father and son would later serve together as joint pastors at the church. In 1969, King was one of several members of the Morehouse College board of trustees held hostage on the campus by a group of students demanding reform in the school's curriculum and governance. One of the students was Samuel L. Jackson, who was suspended for his actions. Jackson subsequently became an actor and Academy Award nominee. King played a notable role in the nomination of Jimmy Carter as the Democratic candidate for President in the 1976 election. After Carter's success in the Iowa caucus, the New Hampshire primary and the Florida primary, some liberal Democrats were worried about his success and began an "ABC" ("Anyone But Carter") movement to try to head off his nomination. 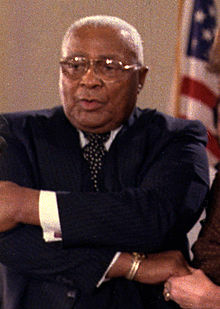 King pointed to Carter's leadership in ending the era of segregation in Georgia and helping to repeal laws restricting voting which especially disenfranchised African Americans. With King's support, Carter continued to build a coalition of black and white voters and win the nomination. King delivered the invocation at the 1976 and 1980 Democratic National Conventions. King was also a member of Omega Psi Phi. King Sr.'s wife and King Jr.'s mother, Alberta, was murdered by Marcus Wayne Chenault on Sunday, June 30, 1974, at the Ebenezer Baptist Church during Sunday services. Chenault was a 23-year-old black man from Ohio who stood up and yelled, "You are serving a false God", and began to fire from two pistols while Alberta was playing "The Lord's Prayer" on the church organ. Upon capture, the assassin disclosed that his intended target was Martin Luther King Sr., who was elsewhere that Sunday. After failing to see Mr. King Sr., the killer instead fatally shot Alberta King and Rev. Edward Boykin. Chenault stated that he was driven to murder after concluding that "black ministers were a menace to black people" and that "all Christians are his enemies". With his son's widow, Coretta Scott King, King was present when President Carter awarded a Presidential Medal of Freedom to King Jr. posthumously in 1977. In 1980, he published his autobiography. King died of a heart attack at the Crawford W. Long Hospital in Atlanta on November 11, 1984, at age 84. ^ "King, Martin Luther (Michael) Sr. (1897–1984)". Kingencyclopedia.stanford.edu. Archived from the original on February 26, 2016. Retrieved March 7, 2016. ^ King, Martin Luther, Jr. (1992). Carson, Clayborne; Luker, Ralph E.; Russell, Penny A.; Harlan, Louis R., eds. The Papers of Martin Luther King, Jr., Volume I: Called to Serve, January 1929–June 1951. University of California Press. pp. 30–31. ISBN 0-520-07950-7. ^ Brown, Deneen L. (January 15, 2019). "The story of how Michael King Jr. became Martin Luther King Jr". Washington Post. Retrieved 2019-01-20 – via stltoday.com. ^ Chapter 1: Early Years Archived 2007-07-16 at the Wayback Machine. The Autobiography of Martin Luther King, Jr.
^ Thespian Net. Samuel L. Jackson. Retrieved 24 April 2007. ^ Burns, Rebecca (2012-06-28). "The murder of Alberta King". Atlanta Magazine. Retrieved 2015-09-05. ^ Boykin II, James M. (2015-06-24). "Church shooting evokes memories, prayers and more letters to the editors". Times Free Press. Retrieved 2015-09-05. ^ DeLaney, Paul (1974-07-08). "Suspect Believed in Religious Hate". Milwaukee Journal. Retrieved 2015-09-05. ^ Bo Emerson (31 January 2018). "Martin Luther King Jr.'s Atlanta: Other historic sites". Atlanta Journal-Constitution. Retrieved 22 December 2018. ^ "In the Hour of Chaos". 15 January 2016. Retrieved 16 April 2018 – via www.imdb.com. ^ Kelly, Kate (18 January 2016). "Daddy King's Story Told in New Documentary". Retrieved 16 April 2018. ^ "IN THE HOUR OF CHAOS!". Retrieved 16 April 2018.